I am so excited about today’s post! Not only do I have an EXCELLENT recipe to share with you, but I will be starting my very first GIVEAWAY!! I’m so glad that I can offer this product to you as a thank you for reading my blog! So now…on to the product. It’s called a Taco Rack (click to view their website). The product that I received is their “Family Fiesta Pack” which includes 2 cooking racks and 4 individual servers. Here’s how it works: The cooking racks are made of stainless steel and enable you to set your taco shells or tortillas securely upright while they bake. I SO wish I had this product when I made my Oven Tacos! The taco rack becomes even more crucial when you want to make a soft taco with tortillas like I did for these shrimp tacos! Another feature that I especially love is how easy it is to put the filling inside the tortillas once they’re situated in the rack. I just easily spooned my shrimp mixture into the waiting tortillas and there was no mess whatsoever! This is definitely an improvement over trying to hold the tortilla in hand while you fill it. After you’ve prepared your tacos using the Taco Rack, then you use your individual servers for presenting them on your plate. I gotta say, this was my favorite part. I really hate putting all the toppings on my tacos, like sour cream, tomatoes, cheese, etc. and then setting it down and the taco falls over and all my toppings spill out. Cmon, I know you’ve experienced that too. Well, these individual servers fix that! You can set your taco in the server to make a lovely presentation on the plate, and you don’t have to worry about all those yummy toppings spilling out. So here’s my overall review of this product: I like that this product is easy to assemble (it’s 3 pieces you slide together), easy to clean, and easy to store. The rack makes baking and filling the tacos WAY easier and cleaner. Plus, it makes it easier to prepare soft tacos using tortillas so that they keep their shape. The servers enable you to make a pretty presentation and not have your toppings fall out, which I appreciate. There’s honestly nothing I dislike about this product. It works exactly the way it’s supposed to, and I had no problems with it at all! The Family Fiesta Pack, including 2 taco racks and 4 individual servers is priced at a $50 value. To enter the giveaway, just leave a comment below, and I will use a random number generator to select a winner! The giveaway will end at midnight on March 31st, 2013. You will only be entered once, so commenting more than once won’t get you more entries. 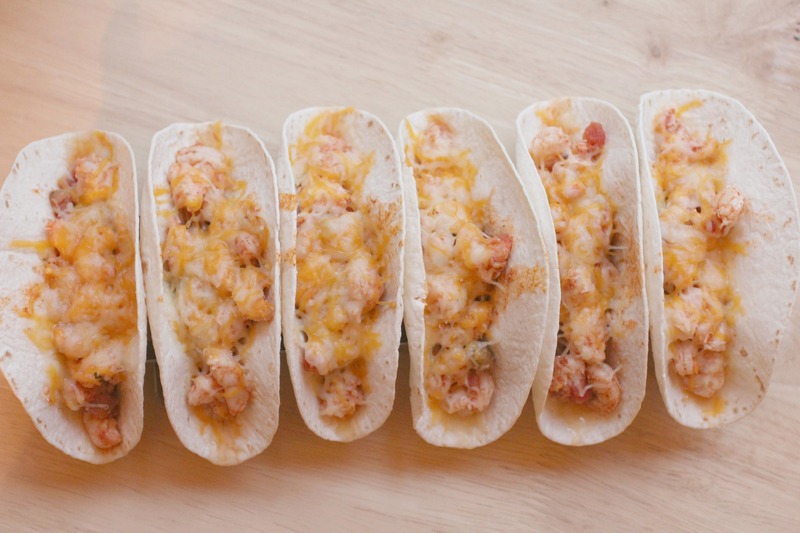 So now on to the recipe for these delicious and SUPER EASY shrimp tacos. Like it’s seriously one of my new favorite meals that only takes minutes to prepare. Shrimp Tacos and a GIVEAWAY! Cut each shrimp into 3 pieces. In a skillet over medium heat, combine shrimp, salsa, and taco seasoning. Cook for about 5 minutes, or until shrimp are opaque. Put tortillas in the taco rack and place on a cookie sheet. Spoon the shrimp mixture evenly between the 6 tortillas. Sprinkle cheese on top of tacos. Bake the tacos for about 7 minutes, or until cheese is melted. I’ve been really digging your blog…now a giveaway! Keeps getting better. Oh and I totally agree with your taco filling issues. I really enjoy reading your blog, you all ways have great ideas and good recipes! Hope I win…love the blog, as always! I love kitchen gadgets, and this one looks like it could be useful for so many different taco recipes especially when making them for a crowd Would love to win!!! Thank you for your Web site, I love it. I follow you just about everyday to see what you are blogging about. Keep up the good work. Oh and I would love the giveaway. I am always looking for new and inventive things for the kitchen. Just wanted to say thank you again. I would like to be your # 1 fan. Thanks! Your posts always make me SO hungry! Everything looks so yummy! I love love love your blog! I look forward to your recipees and ideas! I totally love the concept of the TACO RACK!! Crossing my fingers I win!!!! I would really like a taco rack! Just found your site tonight..Have already printed out several recipes to try this week…. What a great little invention! Along with making regular tacos and taco bake, I like to make the breakfast tacos for my camping friends. The tacos always taste delicious but my presentation could be better. There are 14 of us who camp every weekend during the summer and each mom (or dad) try to make things that are easy and tasty. I’m anxious to try your shrimp taco…I have never had that before. Sometimes it’s hard picking out a wedding or shower gift….the Fiesta Rack absolutely solves this problem. With several weddings coming up, I’m off to a good start in knowing what I am going to give them, plus I can print out my favorite taco recipes. Thanks for helping us moms make things a little easier, we have enough to do!!! What a neat product! I’ve been making tacos for 45 years, & I just don’t understand why it took someone this long to develop such a simply fantastic way of filling & eating that great Mexican dish! I would love to make the shrimp tacos for my sister when she visits, she is quite “the hostess” and this would be something different I could serve her. I look forward to your daily recipes! and now a giveaway? How exciting. What a clever idea LOVE the Shrimp Tacos Recipe too. Hope I win ! Just found your blog and I’m hooked!! Shrimp Tacos?! My two favorite things in one package and so easy with the Taco Rack! Thanks for your great ideas and the giveaway – hope I win! What a neat way to fill taco shells. I never had shrimp tacos but will try these. They look delicious. Hey Lindsay! Your photos are really getting more amazing each day! I esp. love the first picture with all the tacos lined up on the taco rack – and the blue jug in the background. I’m sure these shrimp tacos were amazing! Keep up the great work & have a great week Linsday! You’re first giveaway! That’s so cool!! This looks like a great tool and easy to use. Thanks for sharing! I love Mexican night and this is a great giveaway! Wow how exciting! I have been following your blog for about 2 months now and I can honestly say that I love most of your recipes…and so does my family! Thank you for your dinner inspirations! This recipe looks not only delicious, but easy to prepare…my two most important criteria Thanks! This looks so easy, yummy, and healthy.. love it! Firsts are fantastic. You feel like you are not afraid to take a leap of faith that you will succeed. I love it. I have been having a lot of firsts. It is a good feeling. Love your recipes. Can’t wait to try them. Hope i win!!!!!!!!!!!!!! So cool! These taco racks are awesome! Thanks! Have blessed day. Love your blog! Here’s hoping! Looks like a great idea. Just found this blog…love it! I just recently started following your blog I enjoy your honesty and your sense of humor. Like you, I try to eat relatively healthy Thank you for sharing the recipes and ideas you’ve tried Good luck to everyone in the Taco Rack give away! love, love, love tacos. Who would have thought to put shrimp in one. Must try!!!! Just found your site recently. LUV it !!!!!!! Lucky me, discovering your blog when there’s an awesome giveaway going on! Your tacos sound DELISH. I’m a huge shrimp lover. And I love the taco rack and servers-perfect! 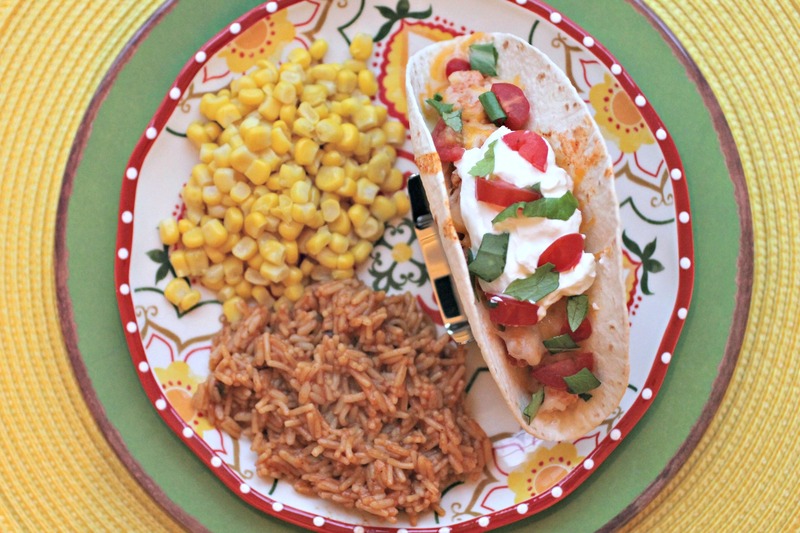 Shrimp and tacos…Seafood and Mexican, two of my favorite meals Can’t wait to try these. We love tacos at my house!! My boyfriend and I make them at least once a week!! Fish tacos are our current favorite but these shrimp tacos look fantastic! Love your blog. Just found it yesterday and already have some yummy recipes to try Can’t wait to get started. I just found your blog as well and love it Can’t wait to read more. Love these racks! They look so convenient! Thanks for the recipe also! I’m new to your blog and have really been enjoying it The kicker was that it’s about normal food I love cooking and have tons of cookbooks, but so often I just skip past a recipe because it is simply not what normal, everyday, average people eat Loving your posts and recipes! Love your recipes! Nice and easy,and great! I just found you a week ago, and been very busy printing & trying new recipes.My husband never knows what he`s getting but he`s been very happy lol. Thank you so much for giving me new ideas on what to make. Love the taco rack. Tacos are great but such a pain to fill. I so want to win this. Why? Because I LOVE soft shell tacos. But lets be serious, who doesn’t love soft shell tacos. Love this blog! The recipes are great! And this taco rack looks awesome. Thanks for sharing! I would love to win this the recipe sounds very good and easy. Never had shrimp tacos before will have to make this. Love you website easy to follow recipes. Thanks you! Great blog, Lindsay I have saved so many of your recipes! Definitely will try this one. 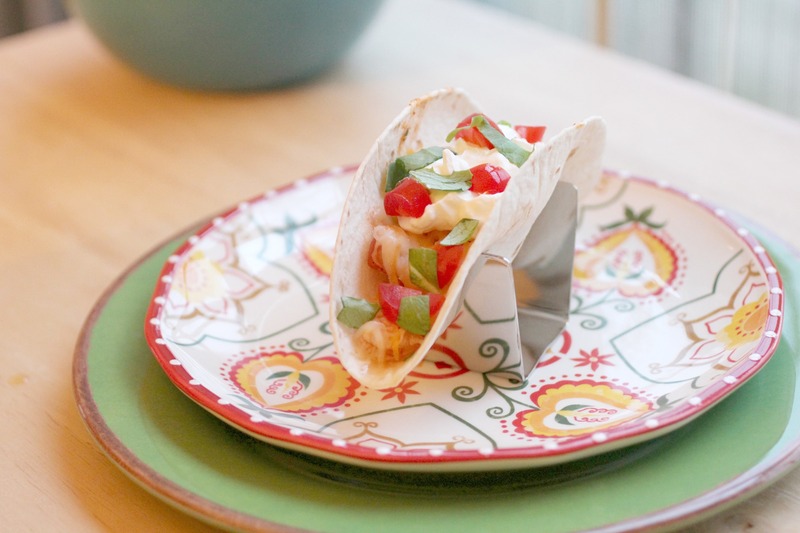 Love your recipes…can’t wait to try this one and I love the taco rack – my husband never wants soft shell tacos b/c the hard shells are so much easier to fill – this is a perfect solution. I love tacos so this would really come in handy Your shirmp tacos look great by the way. How cool is this, we would enjoy the taco rack very much. What a great recipe and a fun product Thanks for the chance to win it! Three of us (myself and two friends) have started a diet and these taco racks will give us a chance to explore and prepare healthy recipes. Those look yummy, I am so glad I found your site, I can’t wait to hit the grocery store and try some of your creations. What a great invention! We love tacos in our house, and we will definitely try this recipe Thank you! Mary F.
That looks wonderful! I will have to try it soon We eat alot of tacos and quesadillas. I make veggie tacos all the time 🙂 … Honestly, they’re just as good!! Love this rack. I love gadgets so I am entering your giveaway! Would love to win this I would make tacos more often if I had this. They are so messy otherwise and I miss making them. Thanks for the chance to win. Just recently joined Normalcooking! Love, love, love it The recipes are so easy, basic, and best of all……great Giveaways make it even better!! This is amazing, and such a simple design! I would love this and so would my family, definitely telling people to come here and check it out! Excellent recipes. Love the taco holder. Would love to have one. Thanks for the chance to win, and thanks for the blog! I would love to have the taco rack, we love tacos, but had just about quit making them, starting making taco salad, maybe I can have tacos again, without the mess. Thank you. Recipe sounds tasty and that’s a great little gizmo as well. Thanks for the recipes and this would be an awesome addition to my kitchen! I love this recipe and Im sure going to use the recipe this week. Thank you for this recipe and all the others you posted This is the first time I have posted a comment on any blog site I am excited to try this recipe for tacos I am 62 years old and grew up eating tacos but never have eaten a shrimp one so this will be a new experience for me. I think your giveaway idea is a good one and I put my wish into the cyberspace barrel with everyone else. Wishing you continued success…..
Loving the blog Lindsay…Keep up the great work!!! You know I love your blog because all of your recipes are so easy! Woohoo! Thanks for doing a giveaway!! This is a great giveaway. Something everyone can use. I love tacos, so I know this would be real welcome in my home and life. Thanks Lindsay. Is it too late for me to post a comment and win this…..What a WONDERFUL product combination…I hope I win it!! Sorry Diana, but this giveaway is closed! We’ve already selected a winner If you’re interested in buying one though, check out tacorack.com. Love you blog! These Shrimp Tacos sound wonderful! Thanks for posting! This recipe sounds amazing, can hardly wait to try it with my family this weekend. So glad I found your site. These are awesome it would make taco night so much easier! Love the recipe, and the taco rack is a great item! 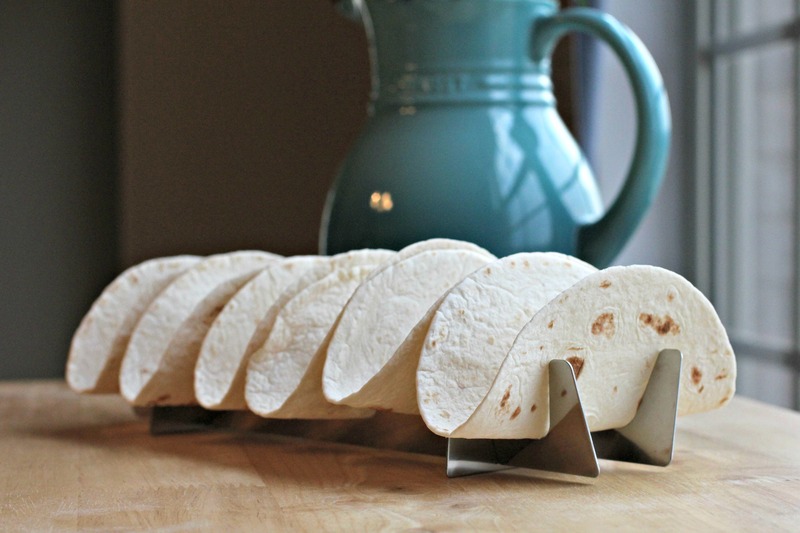 The taco racks are such a great idea for serving and making Tacos… would love these ! the recipe sounds great for summer! the taco rack would make family taco night so much easier too! Love your site! 1st time visitor, and have found several things I really want to try! I wouldn’t mind winning the taco server either. Thanks! these are very good I have made them before, but I like to add some fish with it too. Yum guess we will have these for dinner tonight. I’m definately going to try your coolwhip cookies recipe. Excited to use different flavors of mix to make pretty cookies for a party. I have never tried shrimp tacos but that is on my list to try also. I love your recipes! I will try the taco onesis Iain the taco holder. Lindsay so far I’ve been real happy with your recipes so is my husband. Looking forward to making these tacos the rack will be real handy.